The skin-changer and I sat across from each other at the trucker diner. His skinless throat showed the peristaltic action delivering to his visible belly each bite of his Unlawful Waffle -- "So good, it's a crime!" the placemat proclaimed. The silence continued. "Shouldn't you . . . I dunno . . . be trying to track me down, or something?" I sipped my decaf contemplatively, deciding if an extra cream would help or hinder its lukewarm payload. "What's to track down? You're right here." "Oh, yeah." Chew chew swallow thunk. "I mean, I could be hiding. There might be all these clues you need to figure out, maybe an investigation. There could be this crime scene, see, and you're all like, 'What monster could have done this?' and you figure out the clues to track me to my sinister lair." The skin-changer had just finished speaking as he nodded to the server refilling our cups. "Oh! Oh! Or what if, like, you get to me, and I know you're about to show up, and we have this wicked-cool chase through the city streets. I'd be doing full-tilt, and you'd just barely be keeping up. And we get close to each other and start yelling. See, we're each trying to intimidate the other! But then we start shooting, all cinematic-like. And you think it'd be all complicated, but it's not, even though I got two guns and you're going all rapid-fire on me." "You bet it does! And I got this awesome cursed powder I throw at you, and it makes you bleed fire. And you're all screaming and I'm laughing, but you figure out how to neutralize it. And you even put out the surrounding fires 'cause you got gadgets you can whip up using . . . a salt shaker, a syrup container, and a napkin." "I escape into the night, and you start healing up using all these cool medical skills and trying to convince the neighbors and police that there wasn't anything weird going on. Only, it's not the end . . . it's the beginning! See, 'cause there are all these other situations, and you realize that our fight was just the tip of the iceberg. There could be this whole big story. And we could work on it together, where we look at how to make those fights even cooler -- as part of an ongoing story. Or we could just pick something -- like, find a ready-made idea we could use. Say, you're part of a research team trying to track me down, or you're in charge of keeping a university clear of monsters and I'm in the shadows, or you're in the Mafia and I'm trying to do a 'hostile takeover.' We could totally do this, man!" "Oh, sure. And you just think the perfect guide is just going to fall into our lap? You think someone went to all the trouble to make the perfect sourcebook for the rules and guidelines for making an awesome monster-hunting story? Yeah, right." "Huh. 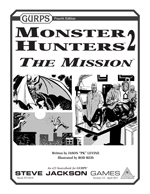 Today's Daily Illuminator is about something called GURPS Monster Hunters 2: The Mission. It says it's on sale now, as part of the Monster Hunters line." "Sounds interesting. Mind if I check it out?" "No skin off my nose." I avoided pointing out the obvious lack of my associate's nasal dermis and purchased the supplement immediately. I didn't know then that in less than 12 hours the diner would be ablaze, the natural consequences of a monster-led conspiracy and the resultant investigation, chase, and gunfight. I can honestly say my adventure began by clicking the "Add to Cart" button . . .